This post is adapted from the blog of RegisteredNursing.org, a Priceonomics Data Studio customer. Does your company have interesting data? Become a Priceonomics customer. The need for registered nurses is expected to grow by 15% from 2016 to 2026, compared to 7% growth across all occupations, according to the Bureau of Labor Statistics. Similarly, the need for licensed practical nurses (LPNs) is projected to grow by 12% and nursing assistants by 11% over the same period. With an aging baby boomer population, climbing rates of chronic issues like obesity and diabetes, and a growing emphasis on preventative care, will the healthcare industry be able to keep up with demand for registered nurses? Along with Priceonomics customer RegisteredNursing.org, we analyzed future registered nursing employment as estimated by the National Center for Health Workforce Analysis in a 2017 report. We discovered that by 2030, the number of registered nurses needed in the United States is estimated to skyrocket by 28.4% from 2.8 million to 3.6 million. 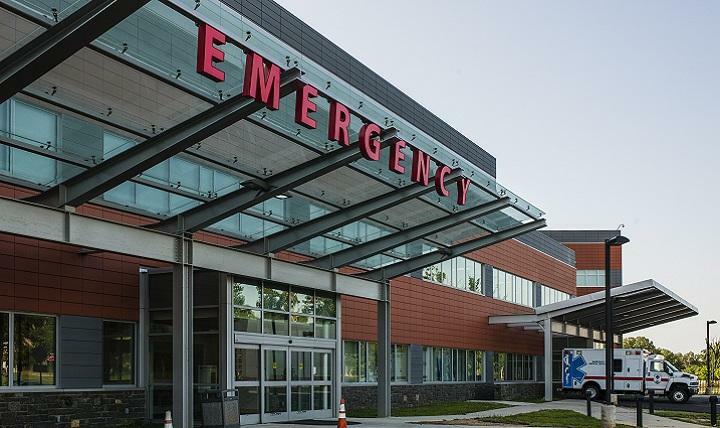 While most states are projected to keep up with demand, there are many places that are expected to have significant shortages in registered nurses. California is expected to be short the most registered nurses (45,500), while Alaska is projected to have the most job vacancies (22.7%). Texas, New Jersey, South Carolina, Georgia and South Dakota are expected to experience shortages as well. Florida will have the most extra nurses (53,700), along with Ohio, Virginia and New York. 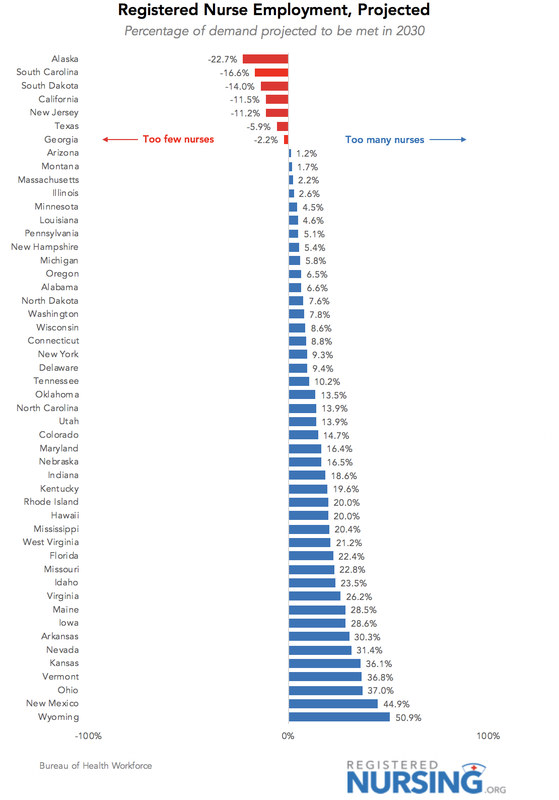 Wyoming will have the biggest overage in RNs (50.9%), followed by New Mexico and Ohio. 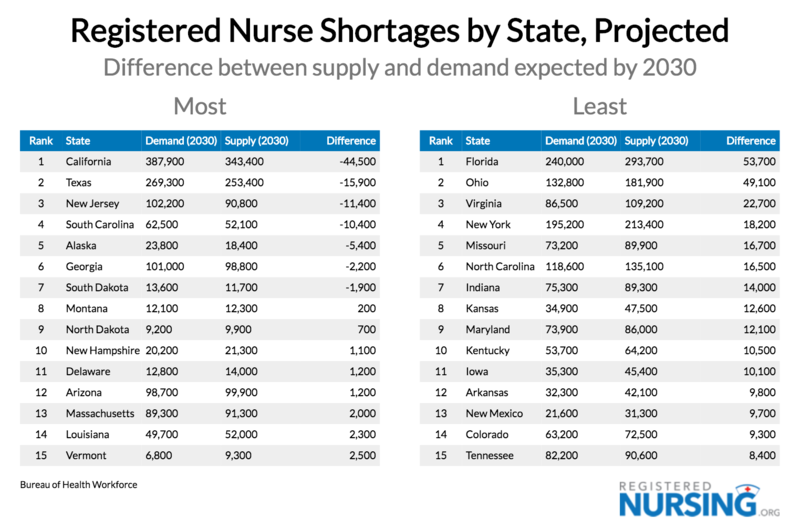 To start, we looked at the projected supply and demand of registered nurses in 2030 to determine which states would have the largest shortages. California tops the list with an estimated 44,500 deficit in registered nurses, nearly three times the deficit in the next shortest state. Texas, New Jersey and South Carolina will lack more than 10,000 RNs; Alaska, Georgia and South Dakota will each be short several thousand. On the flip side, Florida will have far too many RNs, with a projected overage of 53,700 nurses. Ohio comes close with 49,100 more registered nurses than it will need. Virginia, New York, Missouri and North Carolina are estimated to have more than 15,000 extra RNs. California and Florida are huge states with already high numbers of registered nurse positions. How does the shortage look when we take the size of the workforce into account? We ranked states based on the percentage of the registered nurse workforce that is projected to be vacant or overfilled. Alaska, projected to be short 5,400 RNs, will have the largest percentage of the workforce missing - more than 22% of the needed 23,800 registered nurse positions will be unfilled. South Carolina and South Dakota will each be missing about 15%, followed by California and New Jersey, lacking about 11% of needed RNs. The largest overage will be in Wyoming, where there are projected to be 8,300 nurses filling 5,500 positions. New Mexico will have 45% too many nurses, with 31,300 registered nurses to cover only 21,600 needed jobs. Ohio, Vermont, Kansas and Nevada are all estimated to have more than 30% too many registered nurses. Overall, the country is expected to add 795,700 new registered nursing positions by 2030. Are the new positions going to be added in the states that need them most? We looked at which states had the highest number of projected new registered nurse jobs. California is expected to add 110,500 new registered nurse positions by 2030, followed by Texas, adding 88,800. Neither amount is expected to be enough to counter the shortage both states will face. Florida, on the other hand, is expected to add too many positions, creating 69,400 new registered nurse jobs, resulting in an overage of more than 50,000 nurses. 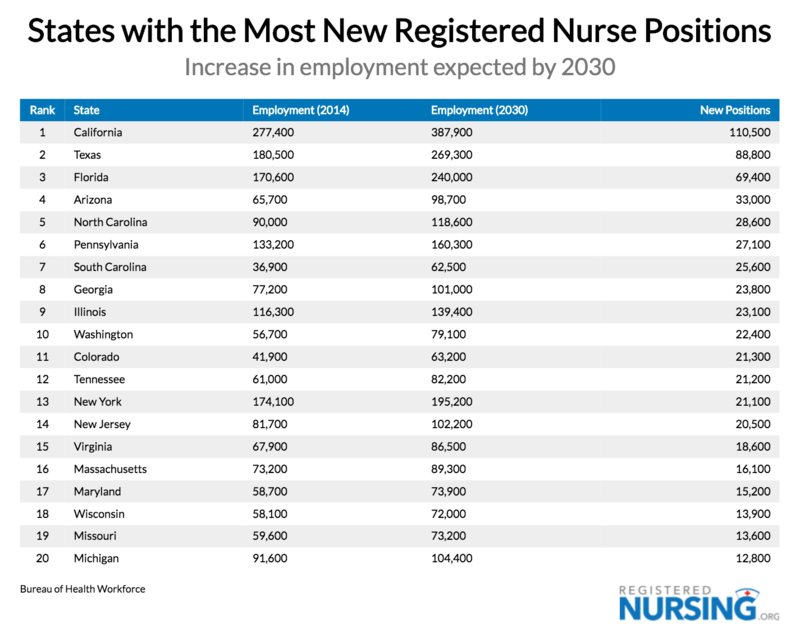 How do the number of new positions compare to the existing registered nurse pool in each state? 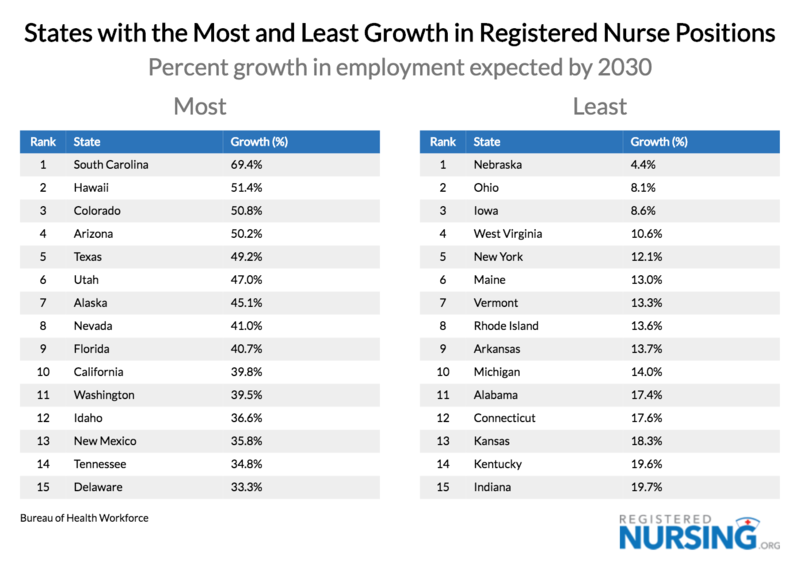 We looked at the states with the biggest and smallest percentage growth in jobs for registered nurses by 2030. South Carolina is expected to experience the most growth, adding 26,600 new jobs to an existing workforce of 36,900 registered nurses (69.4%). Hawaii follows with 51.4%, or 5,600 new positions added to the 10,600 already working on the islands. Nebraska is expected to grow the least by 2030, adding only 900 new registered nurse jobs to the existing 20,300 (4.4% growth). Ohio and New York are among those with slow growth rates (8.1% and 12.1%, respectively) that are expected to have large overages as the supply of registered nurses outpaces demand. Growth is extremely uneven across states and regions, resulting in expected shortages and overages of registered nurses. Are the places that are going to be short-handed doing all they can to attract new RNs to their states? 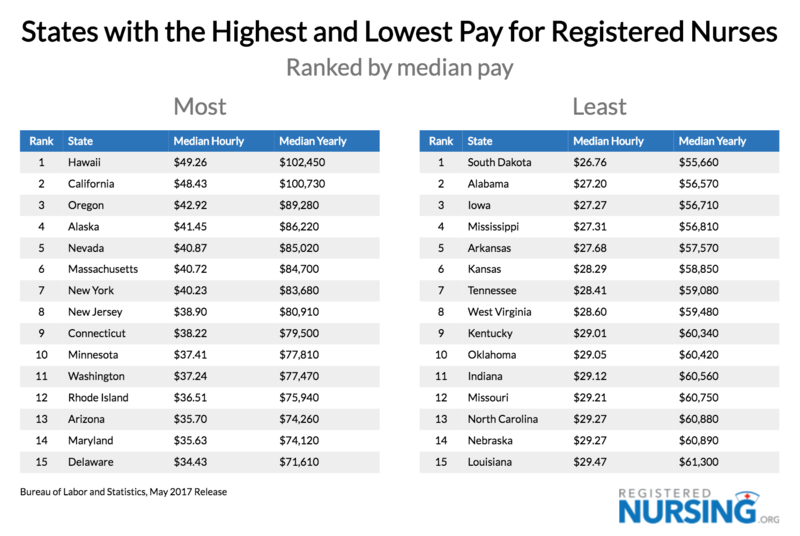 To find out, we consulted the Bureau of Labor Statistics to determine which states have the highest and lowest wages for registered nurses. Hawaii and California pay RNs more than any other states, with median wages totaling more than $100,000. Higher cost of living and growth contribute to high wages in western states, with Oregon, Alaska, and Nevada following with wages between $85,000-$90,000. Southern and Midwestern states tend to pay less, partly as a function of cost of living. Despite facing an oncoming RN shortage, South Dakota offers the lowest annual median pay at $55,660, alongside Alabama, Iowa and Mississippi. To see if projected shortages are influencing wages, we looked at the values using a scatter plot. RN salaries remain a function of cost of living and location, with annual median wages being barely affected by impending registered nurse shortages. States with expected shortages have pay rates ranging from more than $100,000 in California to under $60,000 in South Dakota. States facing overages are similarly all over the map, from $102,000 in Hawaii to $56,000 in Alabama. With most states facing an overage of registered nurses, it will be increasingly important for RNs to distinguish themselves from their peers and job competitors. Registered nurses with four-year Bachelor of Nursing (BSN) degrees are more likely to hold supervisor positions and earn higher salaries. 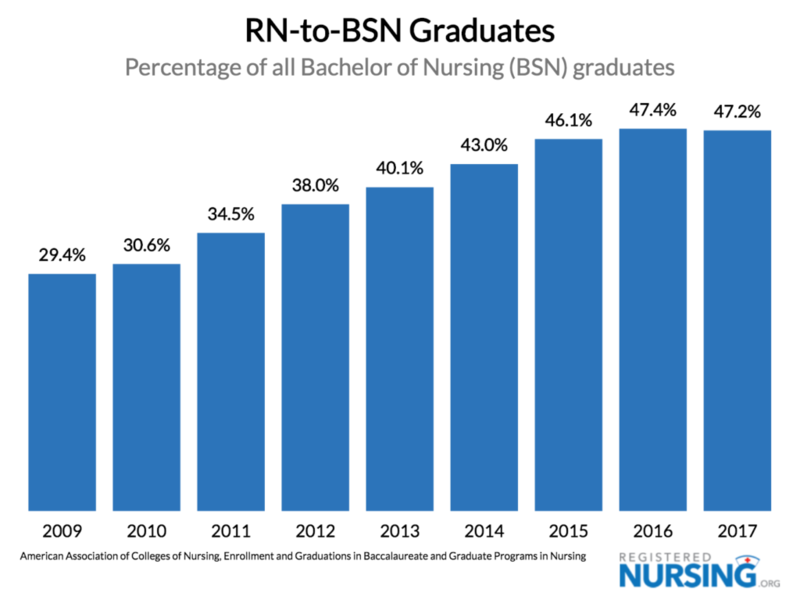 Practicing RNs with Associate degrees or diplomas are seeing the benefit, too, with the percentage of BSN graduates who pursued an RN to BSN program soaring from 29.4% in 2009 to 47.2% in 2017. The need for registered nurses is growing twice as fast as the average occupation. By 2030, the demand for RNs is estimated to grow by 795,000 full time positions, from 2.8 to 3.6 million jobs. Not all states are prepared to handle the rapid increase in need. California will be adding the most new positions by 2030 - more than 110,000 - but is still estimated to be more than 40,000 nurses short. 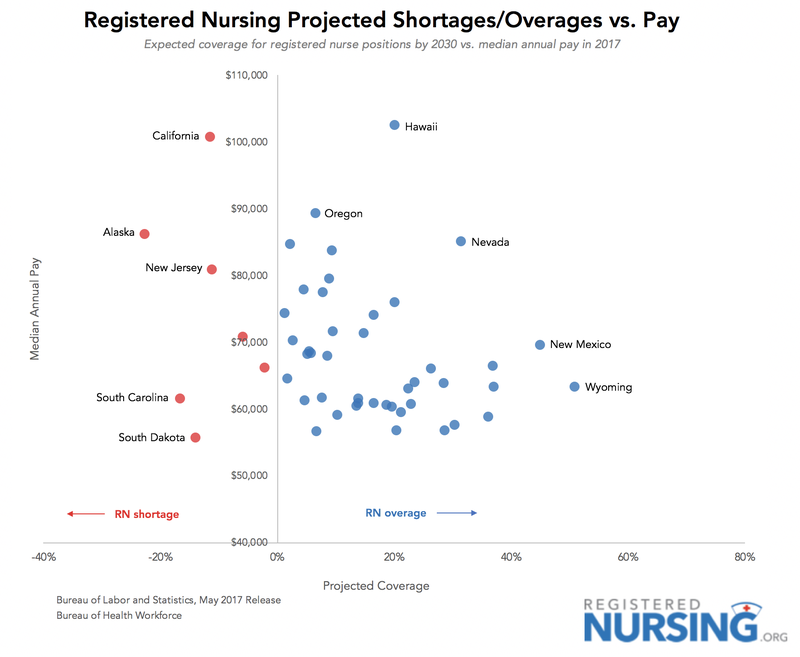 Likewise, Texas, New Jersey, South Carolina, Alaska, Georgia and South Dakota are all projected to experience shortages in registered nurses. Florida, Ohio and Virginia are estimated to have the biggest excess in nurses.